A college says it has had an "extraordinary" response to its plan to launch a course in coffee-making. Cornwall College's 20-hour barista skills course will start at the Camborne Campus in November. Students will be taught to grind coffee beans and prepare drinks including latte, cappuccino, espresso, tea and hot chocolate. The college says many other countries expect cafe job applicants to hold barista qualifications. The head of hospitality at Cornwall College, Stuart Mathieson, said demand for places for the course had been "extraordinary". "You don't get the training in that kind of thing at many places in Cornwall," he said. "It's education and industry working together in quite a niche way." Mr Mathieson said the curriculum includes the history of coffee, areas where beans are grown, different coffee types and customer service. 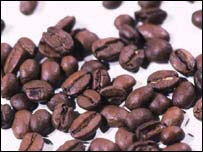 Students will also learn the art of coffee grinding which, Mr Mathieson says, takes time to master. Assessment will take the form of a question paper and making coffee under timed industry conditions. "At first I was quite sceptical about it all but I was gobsmacked at the level of skill required to get it right," Mr Mathieson said. "Once you've had coffee made by a barista then you realise what you were having before wasn't quite as good as you thought." The City and Guilds NVQ Level Two course will be run with local company Origin Coffee's own barista.